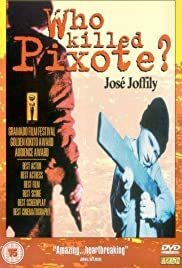 Based on the true story of Fernando Ramos da Silva, actor of Hector Babenco's Pixote (1981). In four different stories, ordinary people of tragic backgrounds search for justice. In 2005, high-ranked criminal Barão is planning the heist that inspired the film. He needs to dig a tunnel linking a house to the Banco Central's vault in Fortaleza, where he'll steal millions of (R$) reais. Stars: José Wilker, Betty Faria, Fábio Jr. This is a 'must see' film for anyone who saw the original "Pixote" and felt at all touched by the stories of the children portrayed there. The talented and unforgettable young star, Fernando Ramos DeSilva hoped that his work in one of the most important Brazillian films ever made, would help change the direction of his difficult life. And it did, but not in the way that he expected, and this is his story. In this effective docudrama, we see the difficulties Fernando had in breaking from the character he portrayed, 5 years before. Showered with attention, money, and praise, receiving awards all over the world for his performance, Nando's dreams of glory and a better life isolate him from those around him, especially his own family, whom we get to know intimately here. This is a tragic tale of broken dreams and life disappointments. Actor Cassiano Carneiro gives a passionate and believable performance as Fernando DeSilva, and the sweet and delicately pretty Luciana Rigueira gives a heartbreaking performance as Cida, the one girl that loved, and never stopped believing in a boy that she met as an actor, but learned to know as a real person, with flaws and insecurities. Their love story is a centerpiece of the film, and their young and indestructible love is something to behold. Admittadly melodramatic at times, as is the norm for Brazillian cinema, this is a fascinating story from start to finish, and the performances are all impressive. DiSilva wanted, more than anything to continue with his acting, and make a difference. Though he never got the chance to act again, this film about his life is a beautiful tribute, and a sign that he will not soon be forgotten, by the millions of people who saw his film, and later, this film, and were affected deeply by his story. Unforgettable!